According to our local weather forecasters, we should not see any more rain until possibly next weekend, and then the chances are slight. Let’s hope so. We don’t need any more rain. Temperatures should be in the upper 70s to low 80s. We have seen pretty much non stop generation for the past few days, and this trend will probably continue. Not certain what they will do over the holiday weekend. It would be nice if we saw some wading time, but we’ll just have to wait and see. Ian and his father, John spent a full day on the water with Jim on Monday. Good day for these guys on the red midge, black midge, and CQ streamer. Ian wanted to work on streamer presentation, so I’m sure Jim worked him well on that. Stan had Jim, from Florida out for half a day. They had a good day on the big ruby midge. Wednesday was a horrible generation day. From about 11:00 a.m. on, they increased the flow enough to raise the water level a foot every hour until they reached 708.9 and 10,000 cfs. Tough day on the water. Jim had Brian and Wanda from North Carolina out for the morning. 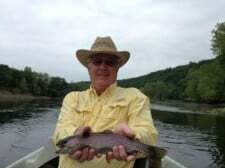 By they time they got the casting down, they water was so messed up it was hard getting many fish to the boat. They did succeed however and caught some fish on the red midge with the copper head black zebra midge, a plain black zebra and had some hits and hooked some on the CQ streamer. Gina also had some new fly fishers, Marlene and her brother Craig, from the Springfield area. Marlene was taking Craig fly fishing for his birthday. They caught fish on the red midge, a few on the primrose & pearl, and several other patterns they tried. Tough day fishing but what a beautiful day! Happy birthday Craig!!! 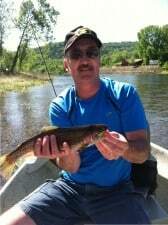 This entry was posted on Thursday, May 23rd, 2013 at 8:25 am	and is filed under Fishing Reports. You can follow any responses to this entry through the RSS 2.0 feed. You can leave a response, or trackback from your own site.